I’m the only one of my friends who uses a headlamp while wrenching, and that means just one thing: my friends are fools. So today, in an effort to enlighten the masses, I will describe the of sheer joy and wrenching efficiency that 1,000 forehead-mounted lumens can bring. 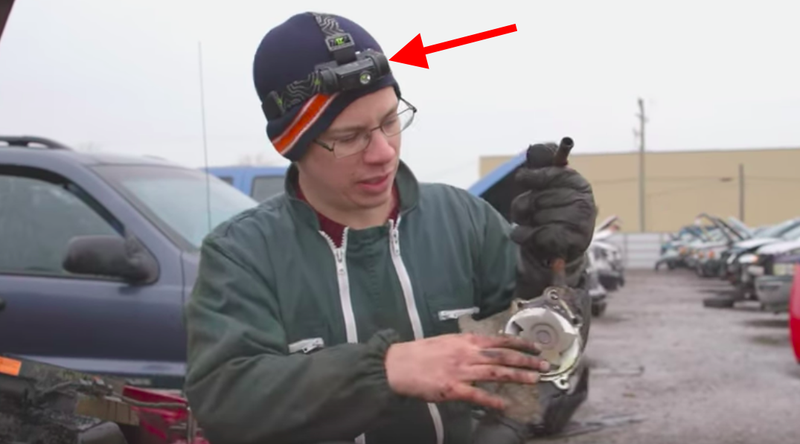 Since the dawn of wrenchdom, there has always been the “flashlight holder”—the least useful and also the most self-conscious person in the garage whose job it is to make sure the person actually doing the work can see what’s going on. All of my friends own flashlights. Many of them also own shop lights like the one shown below, and some have even installed fancy high-output overhead lighting. They’re all doing it wrong. Typical tube-style flashlights require you to either waste a wrenching hand, or make one of your sad friends wield the candelas, which is even worse than just wasting a wrenching hand—it’s wasting an entire wrenching body. Overhead lights are great, except lots of wrenching is done underneath cars, where the lights up top cast shadows. To solve that, many people have a standard corded shop light sitting around. It’s awesome because it can be hooked to suspension or engine parts, letting the mechanic get the light close to what they’re working on. But all of those lighting solutions pale in comparison to a good headlamp. The picture above shows the one I use. It’s micro-USB rechargeable (meaning you can just use most Android phone chargers), has five brightness setting ranging from 1,000 lumens all the way down to just one, has a tough type-three anodized aluminum waterproof body, and it’s got regulation circuitry to keep the brightness from dipping as the battery drains. Plus, since the LED has a relatively warm color temperature, it’s easier on the eyes than a perfectly white LED. Sure it might look dorky to wear, but the headlamp and others like it are actually impressive bits of engineering, and by far the best lighting solutions for any wrencher, because they keep your hands free, and also ensure that whatever’s in your line of sight receives the gift of illumination. Unlike a shop light, which you have to move around and also find a spot to hang every time you look at something new, a headlamp is there, ready to serve. Waiting to light up the darkness for maximum wrenching speed. The headlamp: easily among the most underrated mechanic’s tools.